Kohl’s Return Policy. What is Kohl's Department store return policy? Kohl’s is one of the best department stores that has a wide variety of items you are happy to purchase. But do you also know they have a true no hassle store return policy? Returning to a Kohl’s Store? With an original receipt, you’ll get a refund or even exchange. If you paid with a check, you may get a Merchandise Credit, cash or a Corporate Refund. With a gift receipt, you’ll get an even exchange of a Merchandise Credit. If you don’t have your receipt but paid with a Kohl’s Charge any other major credit card, or added your Yes2You Rewards account to the transaction, Kohls can look up your purchase and give you a refund. Otherwise, you’ll get an even exchange or Merchandise Credit based on the lowest 13 week sale price. Kohl’s may ask for a valid ID, so please have one handy, just in case! Kohl’s stores have the capability to locate a Kohl’s Charge purchase for up to 12 months after the purchase date. Once the purchase has been located, the credit may be applied to your Kohl’s Charge account. At this time, non-Kohl’s Charge purchases, or purchases made outside of the 12 month time frame may receive a Kohl’s Merchandise Credit or a corporate-issued refund. HASSLE-FREE RETURNS RETURN ANY ITEM, ANYTIME, FOR ANY REASON. DO YOU HAVE YOUR RECEIPT? You’ll get a refund or even exchange. If you have a gift receipt, you’ll get an even exchange or a Merchandise Credit. NO RECEIPT? NO PROBLEM! 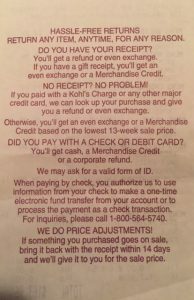 Did you pay with a Kohl’s Charge or any other major credit card, they can look up your purchase and give you a refund or even exchange. Otherwise, you’ll get an even exchange or a Merchandise Credit based on the lowest 13-week sale price. DID YOU PAY WITH A CHECK OR DEBIT CARD? You’ll get cash, a Merchandise Credit or a corporate refund. They may ask for a valid form of ID. When paying by check, you authorize them to use information from your check to make a one-time electronic fund transfer from your account or to process the payment as a check transaction. For inquiries, please call 1-800-564-5740. THEY DO PRICE ADJUSTMENTS! If something you purchased goes on sale, bring it back with the receipt within 14 days and they’ll give it to you for the sale price.